Minx Books, New York, 2007. We’ve all read books where the main character has to start at a new school. Even books where she has to start a new high school six weeks after the start of the year. But Jane’s reason for moving is a little unusual. At her old neighborhood in Metro City, she was in the middle of a terrorist attack. Now her parents have moved their family out to the suburbs, where they feel safer. Jane hates having to leave the city. 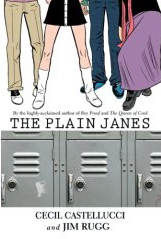 When she sits in the cafeteria at the table for rejects, she learns that the other three girls sitting there are all named Jane. After the terrorist attack, Jane found a sketchbook with words on the cover, “Art Saves.” Can this be true in the suburbs as well as in the city? She convinces the other Janes to carry out some “Art Attacks.” They sign their work P.L.A.I.N.—People Loving Art in Neighborhoods. But the authorities don’t take kindly to any kind of attack – artistic or not. Here’s an engaging and artistic graphic novel about surviving, pressing on, and making a difference.